Yesterday when I was finishing up with my work, I walked over to our local butterfly garden. It's a very nice little garden where my local science center hatches and grows native butterflies. In the back of the garden, they have a nice little goldfish pond. It's probably about 300 gallons or so. 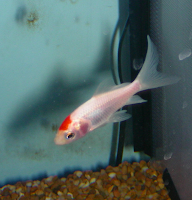 While I was sitting by it and trying to snap photographs of the butterflies that danced by, I noticed a white goldfish with a red splotch on his head, and he looked familiar. A few years past the butterfly garden was the subject of vandalism when some punks broke in and killed a handful of the goldfish. A year or so before then I had donated comet goldfish with a red splotch on his head to them, but I thought him lost in the raid as he is a very recognizable fish. On my way out of the garden, I asked the attendant who had worked there for a while how long that particular goldfish with the red splotch on his head had been there. She told me as long as she could remember, and then proceeded to tell me that the vandals only took the largest goldfish which would not have included my little comet. I came to the conclusion that the unique goldfish in the pond was the little comet, who I had named Tancho, that I'd released there years ago! The attendant was just as shocked as I was and even more so when I told her he could easily live another 10 years there. The only photo I have of Tancho. I spent the next 30 minutes by the side of the pond watching him. His markings have changed a lot. Instead of a neat, almost circular mark, it's spread down to his cheeks. But the rest of his body is still as white as a cloud. And while I did spend a lot of time there, I never managed to get a picture of my goldfish who I'd named Tancho. But it made my day to be able to see him again, so strong and so healthy. 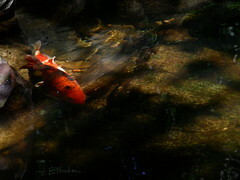 it with three other orange-red goldfish.